In the 1990s, there was AR Rahman in Tamil cinema – and Deva, whose tunes continue to be popular and speak to their fans. The great music composer MS Viswanathan called him “thenisai thendral”, or the breeze of sweet music. The year 1992 in Tamil cinema is remembered for the emergence of AR Rahman through Mani Ratnam’s Roja. That year’s biggest box office hit wasn’t Roja, however, but the Rajinikanth-starer Annamalai. Its music was as popular, if not more, than Roja’s. Its composer was Devanesan Chockalingam, known popularly as Deva. While Annamalai’s songs were melodious and peppy, its background music was extraordinary and tailor-made for its hero. The theme music was so popular that when Rahman composed for Muthu in 1995, he retained a bit of it for the “Super Star Rajni” signage that appears at the beginning of all of the actor’s movies. The 1990s belonged as much to Deva as it did to Rahman. In 1996, Deva composed tunes for 36 movies. His scores played a big role in the emergence of actors Ajith and Vijay, with hits such as Kadhal Kottai, Aasai, Nerukku Ner, Vaali, Priyamudan, Ninaithen Vanthai, Kushi helping them establish themselves as the next-generation superstars. 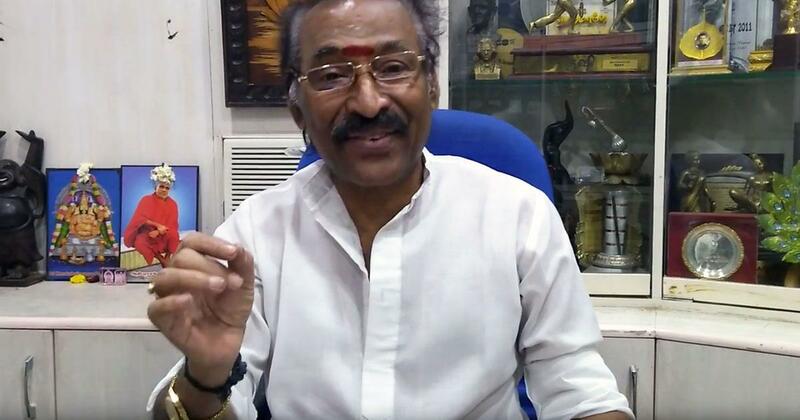 Born in 1950, Deva is often called the “King of Gaana” for bringing the Madras Gaana beat to commercial cinema. In an interview, the composer talks about his humble beginnings, his early struggles, and his chartbusting work during the 1990s. The interview was conducted in Tamil and translated into English. You had no music training until you were well into your thirties. Were you not interested in music in your younger days? I was very much interested. But I did not have the opportunity. My father was a postman and had to take care of a large family. We were always on the brink of poverty. I remember that we did not even have a radio in our home in Mylapore until I turned 18. It was the radios in shops and big speakers at public events that brought whatever little music I heard to my ears in those days. I wasn’t a bright student. I failed the pre-university course at Vivekananda College in Mylapore. The Tamil theatre scene was very strong in the 1960s and 1970s. Kamesh and Rajamani were popular drama musicians. I joined their office as a worker. My job was to get taxis for them since they had to hop from one concert to another every day. At that point, I was interested in music, but had no knowledge of any instruments. So whenever they were not in their office, I began playing the harmonium. I quickly learnt it. In those days, the harmonium was played between scenes in plays to keep the crowd engaged. I slowly started doing that in three or four years. Then, drama stars such as Chandramouli, S Ve Shekar, Y Gee Mahendran started asking for me to play the harmonium. In 1973, music director Chandrabose and I started the Boses Deva troupe. How did you start composing for movies? I think around 1977, we got a chance in the movie Madurai Geetham by Guhanathan. But unfortunately, certain circumstances led to Chandrabose scoring the music on his own. The troupe broke up. I did not know what to do after that. By then, due to family pressure, I took a job in Doordarshan as a floor assistant. My job was to help make the shooting sets. I remember one time when they brought a piano to the set. Since I had some rudimentary knowledge of the keys by then, the workers there would ask me play through the night for entertainment as it was a tiring job. I was suspended for 15 days for touching the piano. I then learnt the piano from Dhanraj master, who also taught Ilaiyaraaja. At the same time, I learnt Indian classical on the harmonium from JB Krishna master. By the 1980s, I began doing devotional albums, which became a big hit. I did almost 450 albums for which all the big singers sang. That is when MS Viswanathan came to an event and told the gathering that I deserve a movie chance. And then ‘Vaigasi Poranthachu’ happened. No. My first movie was Manasukketha Maharasa in 1989, which had Ramarajan. It was not a big success but it put me on the map. And then Vaigasi Poranthachu happened in 1990. The problem with doing devotional albums is that people do not get to see your variety. They think that you can only do one type of music. So it became very difficult for me to convince producers. But Vaigasi Poranthachu opened the flood gates. By 1991, I was doing movies with big stars like Prabhu. Enakena Piranthava, Kizhakku Karai (1991). The movie that made your career was ‘Annamalai’. There is a story that you got that film because there was a misunderstanding between producer K Balachander and Ilaiyaraaja. Yes, I am aware of that story, but at that point I had no clue. One evening, I got a call from Balachander sir. He said Deva, I want you to score the music for my film. I was stunned. I told him it is a great blessing that I could have never imagined. He then said he was only the producer and that his assistant Vasanth would direct the movie [the movie was eventually directed by Suresh Krishna]. My enthusiasm dipped a bit. But still, it was a Kavithalaya Productions movie, so I readily agreed. Just before the call ended, he asked me if I would like to know who the hero is: Rajinikanth. At that moment, the struggles of the previous 42 years flashed before my eyes. I knew this was the defining moment of my life. KB sir made three movies that year. Annamalai with me, Roja with Rahman and Vaname Yellai, his own direction, with Maragadamani. All three were massive hits. And Vairamuthu made a comeback that year. Yes. He wrote the lyrics for all three movies. He is an extraordinary lyricist. And he used to do it with such ease that it was a pleasure to work with him. You cracked the Rajinikanth formula with ease. Whether ‘Annamalai’, ‘Baasha’ or ‘Arunachalam’, you owned the Rajinikanth film theme music and introduction song. How did you approach these songs? KB sir told me one of the reasons he came to me for Annamalai was because it was a Madras subject. In Baasha, the director explained that Rajini will be introduced as an autorickshaw driver. Rajini, in fact, came to the studio for the composition. The first tune I gave had a modern tempo to it with some western beats. Rajini was not convinced. He reminded me of Vanthenda Paalkaran of Annamalai and said he wanted the Madras local feel. That is how Autokaran Autokaran happened. These songs had to be massive in terms of their tempo. They had to make the fans stand up and shout at the top of their voices. It is a unique part of Rajini’s persona. and so we spent considerable time on these songs. There is always a classical twist to your songs, and yet, many think that you are not technically strong. I never composed a song keeping raagas in mind. To me, the fundamental feature of a film song is that it should immediately register in people’s minds. I focused more on the pallavi [the first part of the song that leads to the charanam]. Most people remember only the pallavi. For example, do you remember the charanam of Singaravelane Deva? Because I was very focused on the listener and wanted my tunes to be simple to sing. I may not have done many complex compositions. But I have done hundreds of Carnatic-based songs. You gave a famous fusion twist to Tyagaraja’s ‘Manavyalakinchara’ in ‘Nerukku Ner’. That was [producer] Mani Ratnam’s idea. He produced that movie. He mentioned that composition to me and asked if we could do something like that. But it was only the pallavi that I adopted. The charanam was entirely mine. And you wrote the notes yourself? Yes. I composed the songs and would then sit with the musicians. In Annamalai, KB sir suddenly called up one evening and said they wanted to have another song in the movie by next evening so that shooting could be completed. This was Rekka Katti Parakuthaiya. For that interlude, we had to use an orchestra of 40 musicians with 25 violins. I composed that song in 20 minutes and we finished the recording by afternoon. I have four brothers. All were musicians who worked with me. They also played important parts. Sabesh and Murali later became music directors. You are often criticised for copying tunes. In ‘Mugavari’, you openly used tunes from Backstreet Boys. Directors will come and give you a song and say they want something like that. With Mugavari, when that song was given to me, I thought it was an old song from at least 10 years ago. It turned out to be a fairly new song. I may have used bits of it. But the majority of the tune is an innovation on these songs. Sometimes, some phrases come in unconsciously because those are tunes you grew up with. Manam Virumbuthe, Nerukku Ner (1997). Apart from Rajinikanth and Kamal Haasan, you have scored for the bulk of the movies of the younger generation, including Ajith, Vijay and Simran in the 1990s. Is there a difference in the way you composed for them and for, say, Rajinikanth? I was able to experiment more with the younger actors. And you had to take into consideration things like choreography. Rajini sir would say he was not getting younger, so the beats had to lend itself to easy dance moves. But this was not an issue with the younger heroes. So I did a lot of things with the tempo. We had young choreographers like Prabhudeva and Raju Sundaram coming up. Those were wonderful years. It also helped me use new voices like Hariharan, Anuradha Sriram, Harini. AR Rahman became a massive phenomenon in the 1990s in Tamil and Hindi cinema. Was there pressure on you to compete with him and make music like he did? There were films that would come only to me. But yes, some directors would point to Rahman and would say they want something like that. The idea was to keep in touch with what was happening in the field and what others were doing. You cannot work in isolation. Otherwise, you will become stale. If there is a trend, you should be part of that trend, but also ensure that you leave your stamp on it and try to bring in original elements that define you. One element that has defined you is the Gaana-influenced song. How did you become familiar with the Madras Gaana genre? Like I said, I lived in Mylapore, which has many slums. In my younger days, I used to watch night shows and walk back home. That is when I began listening to these sounds. I realised that these sounds were very unique to Madras. So when I started composing, I decided to bring this into the movies to add to the Chennai character. In fact, the very term Gaana was popularised by me. You took a genre that reflects the culture of a community and depoliticised and commercialised it. Your Gaana was not the Gaana of North Chennai or the city’s slums and fishing hamlets. I do not disagree. But you need to realise that these were sounds that you did not hear at all. Rather than saying I commercialised these sounds, I would say that I made these sounds mainstream. But this did not happen easily. It took 20 years of constantly putting these songs in the movies to get the genre a larger acceptance. By the 2000s, even the very rich who looked down upon these beats and thought they were played for only certain occasions started demanding that I play them at their wedding concerts in elite wedding halls. I am happy that I was able to bring these sounds from the ignored corners of Chennai to commercial cinema. It also gave Gaana artists a boost and increased their earnings. Katthu Adikkuthu, Ninaivirukkum Varai (1999). Both Rajinikanth and Kamal Haasan have now entered politics. Songs such as ‘Singam Ondru Purapattadhe’ from ‘Arunachalam’ are likely to be played during their election campaigns. Did you have any inkling of the political future of these songs? Not at all. The idea was to make songs with mass appeal. But it was not like MGR songs, where it was openly political. I have done campaign songs for former chief minister Jayalalithaa. The song Thanga Tharagaye was played every time she entered the stage during election campaigns. Both Rajini and Kamal are dedicated artists who have worked hard to reach where they have. I am certain they will show that same dedication in politics. But it is for the people to decide.